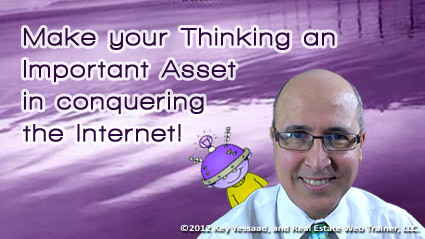 The thinking you bring to the internet as a Real Estate Professional is an important asset to the growth of your business. The tools of the internet are varied and they keep changing as Internet Marketing becomes more and more sophisticated, but there are some fundamentals to this Internet Madness that once understood help you navigate and grow organically with them. Think of this way; as a kid you were introduced to language and to the fundamental building blocks of using verbs, adjectives, nouns, adverbs, conjunctions, pronouns, etc… in other words the elements of Grammar and Language. Once you had a rudimentary understanding of such elements you were able to build complex thoughts and understand more complex ideas. Web Marketing, SEO, Blogging, Social Marketing, Websites, and Mobile Presence are connected by the thread of Internet Fundamentals – you must commit yourself to not only understand how these building blocks work together, but then to leverage them for the benefit of your clients. This has been my commitment from the get go – I empower agents and brokers get the fundamental understanding of so-called complex internet systems, then offer my participants plans of actions they can trust to grow their long term success on the internet.